Medgar is a tough, proud Appalachian town—where neighbors sip sour mash whiskey and gossip on their porches, kids plunge into sparkling swimming holes, and the slow decline of the coal industry is met with gritty pragmatism. It’s also the new home of 14-year-old Kevin and his mother, who are there to regroup after a family tragedy. But author Christopher Scotton’s second novel is more than a poetic coming-of-age novel; it’s also a small-town murder mystery and epic adventure story. We couldn’t shake the graphic, sometimes brutal images of The Secret Wisdom of the Earth, which are woven together in a powerful, poised protest to physical and environmental violence. 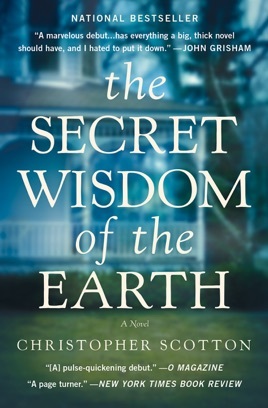 Scotton's accomplished debut is the story of Kevin Gillooly, a 14-year-old boy who moves to coal country and learns about courage and violence, beauty and danger, from his wise, weathered grandfather and a best friend well versed in backwoods survival. Kevin's mother brings him to her hometown of Medgar, Ky., after the death of Kevin's three-year-old brother. Kevin's grandfather Pops is a large-animal veterinarian and hires Kevin as an assistant. Pops also introduces him to books like Treasure Island and gives him time off to explore the surrounding mountains with his friend and confidant Buzzy Fink, who teaches Kevin how to use slugs to treat spider bites and other survival skills. Kevin sees land destroyed by mining, hears exploding mountaintops, and feels the fly-rock, while Buzzy witnesses the beating of gay hairdresser and anti-mining activist Paul Pierce. Both Kevin and Buzzy are tested during a camping trip with Pops, when an unknown assailant tracks them down and opens fire in the wilderness. Scotton's cast of classic Appalachian characters also includes housekeeper Audy Rae, Cleo the high school football hero, the violent and inbred Budget family, and an array of old men shooting the breeze at Hivey's. The coming-of-age story is enriched by depictions of the earth's healing and redemptive power. Neither the first portrait of mining country nor the most original, Scotton's novel nonetheless makes for compelling reading when the action grows intense managing, like the landscape it describes, to be simultaneously frightening and beautiful. Slow start, but a wonderful read once I got into it. I really appreciate the small town life of Kentucky and the Hollows and the woods all put together. Having lived back in this area and traveled all around it, it was nice to read about the people there and the lives they lived. Loved this book! The characters were so expertly defined and the writing was excellent, and the tragedies heartfelt!! Very captivating towards the end but starts slow. Great descriptive writing, it gets you acquainted with the characters quickly.